Nightshift makes me delirious! Three shifts in row working 7pm to 7:30am and I turn into a crazy girl with wild ideas. I punch the clock at 7:29am the morning of my third shift and- look out! I usually get myself into some type of crafting project… or rearrange furniture…. or stop by Ducktown for drinks with my fellow nurses… or run a few miles around town with my dog. At this hour, anything goes! Last month I up and booked a trip to Jamaica. A couple of weeks ago I was on my way home from work and got the inclination to make homemade jellies and jar them by the case. So… I stopped at the grocery store and filled up a shopping cart with mason jars, produce, fruit pectin, and bags of sugar. 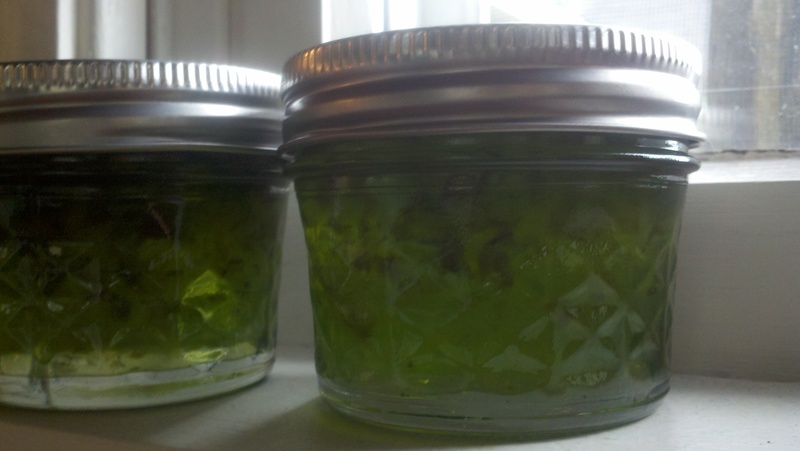 A couple of hours later… enough jalapeno pepper jelly and grape jam to last me a few years. Ugh, I need to make some sort of note to self: GO HOME AND GO TO BED!! Pour over a brick of cream cheese and serve with crackers.